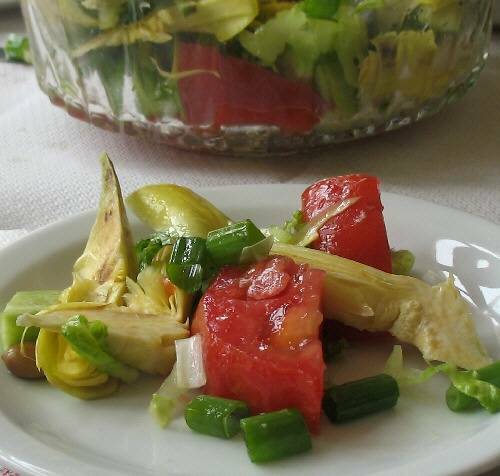 Fresh (uncooked) artichokes, trimmed down to the tenderest part of leaves, heart, and stem, are thinly sliced into a salad with lettuce, tomato, cucumber, and spring onions. A handful of Greek olives, olive oil, and lemon juice add the finishing touch to this elegant salad. Trim off all but 1 inch of the artichoke stem. Trim off outer green leaves, leaving internal yellow leaves. Trim off top 1/2 to 1 inch of the leaves with needles. Cut artichokes in half to reveal the choke. Cut in half again. Rub each piece with lemon. With a sharp knife, cut out choke and discard. 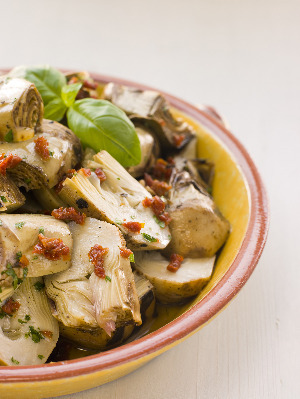 Cut artichoke into long very thin slices, place in a bowl and sprinkle with lemon juice. Toss to coat well. 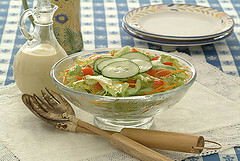 Sprinkle the tomato and cucumber with salt and place in a large salad bowl. 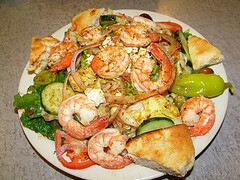 Add lettuce, spring onions, and artichoke slices, along with a little lemon juice from the bowl. Add 1 tablespoon of olive oil, toss, and taste. If the taste is too lemony, add a little more oil. Toss in a handful of green Greek olives, and serve.